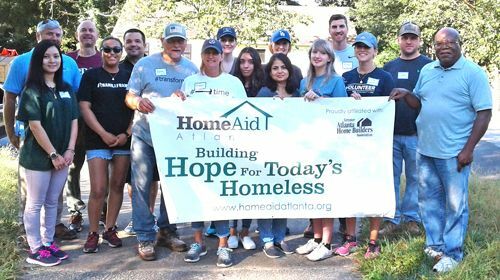 HomeAid Atlanta volunteers on September 7, 2018. ATLANTA - Sept. 17, 2018 - PRLog -- HomeAid Atlanta, with support from many groups and individuals, recently completed a series of Care Days at Sheltering Grace Ministry in Marietta. Sheltering Grace is a service provider that helps homeless pregnant women and homeless mothers with infants by providing housing and the tools to achieve independent living. HomeAid Care Days provide upgrades and repairs completed by volunteers at housing facilities throughout metro Atlanta. The first of the Care Days took place in late August. Volunteers from Horizon Painting & Renovations' management team, as well as their professional painters, painted most of the interior of the three-bedroom home - a much-needed project. The company also painted the exterior of the home. Horizon's Director of Operations, Melanie Caceres said, "I love HomeAid's mission and how they make it easy for anyone with any skill set to help people experiencing homelessness!" Horizon Painting & Renovations donated its labor for the Care Days and provided a large discount for the exterior painting. PPG generously discounted the interior paint. Part-two of the event was in partnership with the Greater Atlanta Home Builders Association's (HBA) Cobb/Cherokee Chapter. Chapter President, Phil Gressly with Superior Distribution, worked with industry friends, including a roofing crew led by Tino Crews, to provide a major discount on the installation of a new roof. The Home Depot provided a substantial discount on roofing materials. On September 7, with the new roof in place, Cobb/Cherokee Chapter volunteers and students from Georgia Gwinnett College, spent the day completing interior painting, exterior trim painting, landscaping, and clean-up projects. Behr provided paint estimation services, as well as paint for the exterior of the home. Phil Gressly remarked, "The Cobb/Cherokee Chapter enjoyed working with HomeAid Atlanta during the HomeAid Care Day at Sheltering Grace. Giving back to the community is very important to members of the HBA, and I'm happy I was able to help coordinate this project and get so many HBA members involved. I am proud of the members of the Cobb/Cherokee Chapter in making such important improvements to the house." The Interior Partners' Ashely Norred and Cindi MacPherson donated design services and furniture for the bedrooms to complete the final phase of the project. Takeaway Movers donated moving services to deliver the furniture to the home. Thanks to the generosity of these donors and volunteers, HomeAid provided a savings of approximately $9,000 for Sheltering Grace Ministry over the course of the project. HomeAid Atlanta, founded in 2001, is a nonprofit organization that builds new lives for homeless families and individuals through housing and community outreach. HomeAid works in partnership with the building industry, as well as community organizations, to assist people experiencing homelessness. To date, HomeAid Atlanta has completed over 100 housing, remodel and care day projects at locations serving victims of domestic violence, teen mothers, veterans and more. HomeAid is the designated charity of the Greater Atlanta Home Builders Association. Learn more at www.homeaidatlanta.org.